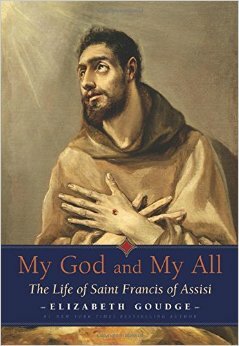 This book on Francis of Assisi challenged everything I knew about the man. Everything I had heard about him was passive. He is constantly quoted as saying, ""Preach the gospel at all times; when necessary, use words." Apparently, there is absolutely no record that he did say or write that saying. It makes me think of the statue that is common in home gardens with St Francis and adorable bunnies at his feet. His real life was intense and passionate. This man was not some poor man that took a vow of poverty. He was well off and expected to take over his father's business. He had a divine encounter at a local church and took a vow of poverty. It cost him his family. The vow he took was much greater than anything the Catholic church had seen before. He was a reformer. He confronted all sorts of people in authority. His life was full of trial. I was struck by how he would starve himself until he was ill and he often scourged himself to remind him of his sin and to identify with Christ. It is said that he received the Stigmata, supernatural wounds identical to those of Christ that would ooze. His story is much more wild than I ever imagined. Every page was an eye-opener. This book was graciously given by Plough Publishing for review.